Lately there have been a lot of movies about young love and vampires and not enough comedies about guys who let loose and do stupid stuff. 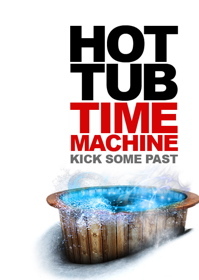 So if you’re in need of a great comedy, I recommend Hot Tube Time Machine. The movie is about four friends who go on vacation and end up in the year 1986. There’s Adam (John Cusack), who just got dumped by his girlfriend; Nick (Craig Robinson), the guy with a dead-end job and a controlling, unfaithful wife; Jacob (Clark Duke), Adam’s weird nephew; and Lou (Rob Corddry), an out-of-control party man with no morals, who actually hates his life. After a miserable Lou tries to kill himself, his friends try to cheer him up by vacationing at a ski resort they used to go to when they were teenagers. After a hard night of partying, they wake up the next day and see girls with puffy curls wearing pink, lime-green and orange clothes and guys with big hair wearing polo shirts tucked into their pants. After watching President Ronald Reagan on television and questioning someone about Michael Jackson, they realize that they went back to 1986. When I saw the commercial for Hot Tube Time Machine I expected the jokes about the 80s hair and clothing styles and lots of 80s music like Madonna, Cindy Lauper or Michael Jackson. But to my disappointment the movie didn’t include as much of that stuff as I thought it would. At first they decide not to change the past because it might alter things in the future and their attempts to avoid changing the future are hilarious. Adam has to get stabbed in the eye with a fork after dumping a girl and Lou has to let himself get jumped by a bunch of guys. A lot of the humor is sexual and/or immature (it’s rated R). Some people might find the movie offensive, but it was intended to make people laugh and it did exactly that. I laughed so hard my stomach hurt. In addition to the humor, the movie includes a lesson—that the power is in you to change your life. Cusack, Robinson and Corddry were perfect for this movie. Their characters were so believable and well played. Their performances and the jokes made this movie a must-see comedy.